The product and/or services including playing of free and Real Money Games is restricted to persons who are 18 years of age or older and are bona fide residents of India, except for the states of Assam, Odisha, Nagaland, Sikkim and Telangana. We may limit access to our product and/or services at our discretion. By reading this document you confirm that you are not accessing our product and/or services from anywhere in the state of Assam, the state of Odisha, the state of Nagaland, state of Sikkim, state of Telangana or outside India. Your winnings from a single Pool Rummy Game, a single Points Rummy game or a single contest or tournament are credited into your wallet in the form of Passion Chips, which may be recontributed towards future games or tournaments, or cashed out (except in the case of bonuses, which cannot be cashed out). Winnings are computed on a net basis, exclusive of your contribution to the game / tournament. Should you choose to withdraw your winnings, the Passion Chips are converted into cash. There are no caps on the amounts you can withdraw from your wallet. Upon making a withdrawal request, the balance deposit is first returned to you, and any remaining withdrawal amount is deducted from your winnings. Assume a player takes part in a game of Pool Rummy with INR 4,000 entry fee and his winning is INR 22,000 in that Pool Rummy game. The net winning in this case will be INR 22,000 – INR 4,000 = INR 18,000 and hence the TDS deducted will be INR 5400 i.e. 30% of INR 18,000. The amount of credit he will receive in his account will be INR 18,000 – INR 5,400 = INR 12,600. Assume a player takes part in a game of Deals Rummy with an entry fee of INR 10,000 and wins INR 20,000. The net winning for this player in this game will be INR 10,000 and hence the TDS deduction will be INR 3,000 i.e. 30% of INR 10,000. The amount of credit he will receive in his account will be INR 10,000 – INR 3,000 = INR 7,000. At any point, we may require documentation for verification of all or part of the information you provide or have provided in the past. Your failure to do so will result in the suspension or cessation of your registration with us. You understand and in agreement with the fact that we will deduct tax at source or TDS at the rate of 30% on winnings when withdrawn greater than INR 10,000/- in a single Pool Rummy Game, a single Points Rummy game or a single contest or tournament. The Passion Chips when withdrawn is converted into cash and any amount in excess of Rs 10,000 withdrawn from winnings will attract 30% TDS. 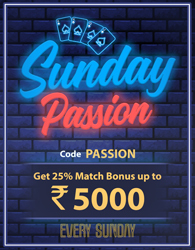 All winnings in form of Passion Chips can remain in your wallet without any TDS implication. You must submit your PAN card details or Personal Account Number issued to you by the Income Tax authorities in India. We will verify your PAN details occasionally and have the right to forfeit any winning in cash or kind if your PAN details are unverifiable, incorrect or are found inaccurate during our verification. You will be permitted to withdraw your winnings only after you provide your correct PAN details and after the TDS has been subtracted from your account. TDS and any other taxes levied by the Government of India are subject to change and the applicable taxes and deductions will be deducted from your account. RummyPassion.com will provide you a certificate of taxes deducted. RummyPassion.com is not a tax advisory body and is in no way responsible for your tax liability or filing. You accept that you yourself will play all games on our website and will not take external assistance of any kind to play. You agree not to use or create cheats, hacks, bots, software, external or internal device or any other unauthorized component which is capable of blocking, modifying, manipulating, mining, intercepting, collecting or relaying information from or to the RummyPassion.com website. Use of external assistance of any kind is strictly prohibited while accessing RummyPassion.com website or playing games on it. Fraudulent behaviour including forming teams and collusion between you and any others for participating in games or tournaments organized on the RummyPassion.com website or any other form of deception is banned. If any fraudulent behaviour by you is ascertained, the game or games in question will be rendered null and void and will initiate an action against offenders. You may make one withdrawal per calendar month free of charge. All subsequent withdrawals may be subject to a processing charge. If you enjoy a VIP status, you may be eligible to make more than one free withdrawal per calendar month. If the amount of the processing charge is greater than the balance in your user account, your withdrawal will not be processed till such time that your account balance becomes greater than the processing charge. Our effort is to process your withdrawals within the stipulated time but there could possibly be delays because of time needed to complete verification and completion of the withdrawal transaction. RummyPassion.com is not liable to pay you any compensation for delays in remitting payments to you from your user account.